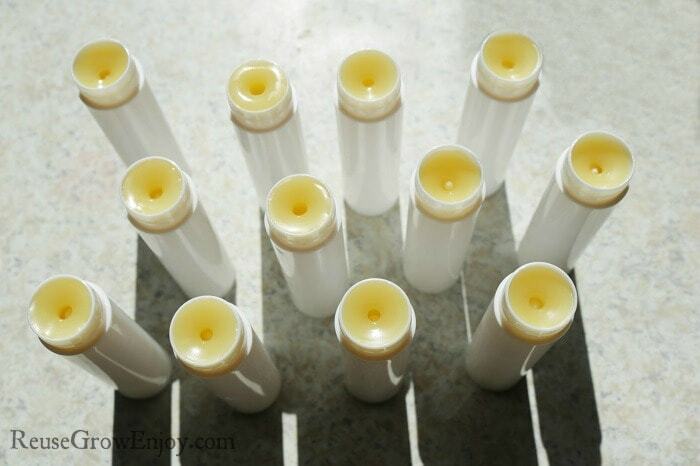 Making your own peppermint lip balm may sound like a daunting task, but it isn’t as hard as you may think. It can be very fun to do and it makes great gifts. Using essential oils for the scent and flavoring is the best way to go, as they are natural and give your body some great health benefits, too. 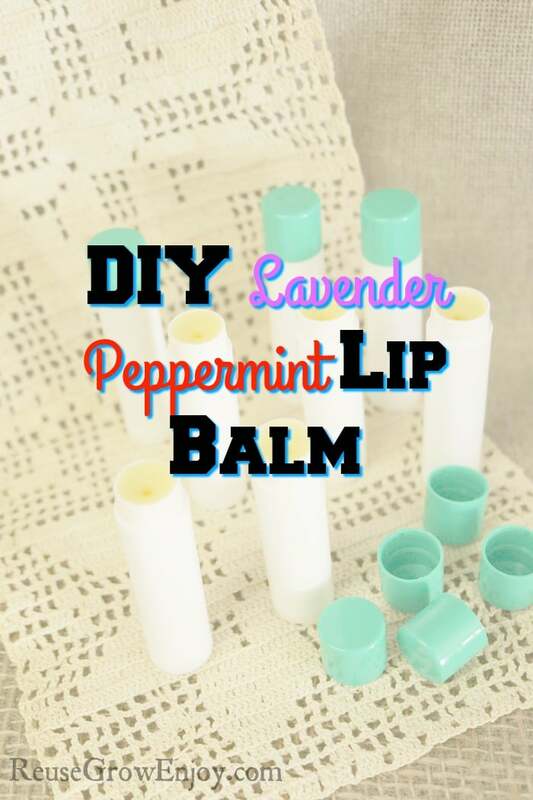 This particular peppermint lip balm recipe includes all natural ingredients in the base and then has both peppermint and lavender essential oils. Peppermint adds a little kick and cooling effect for your lips, plus the great flavor. Lavender is wonderful for your skin and helps protect and encourage calm for you as well. You can add a few more drops of either if you prefer, this amount will be minty but not overly so. If peppermint is not your thing, you can add spearmint in its place. Candelilla Wax is not as common, but it helps keep the balm from melting if it gets too warm. It will come out nice without it, but if you are concerned with it getting warm and having an issue, I would recommend using it. First, you will need to melt your beeswax over medium to high heat in the double boiler. Don’t let it get too hot, as it will lose the great properties in the beeswax if it burns. Bringing it up to temperature slowly is always best. You can use a spoon and a knife when making balms and have it as a designated set for wax. That way you don’t have the build up from it left on your regular utensils. Then when you stir the wax, you can scrape any excess off with the knife and put it back in the pot to melt. While the wax is melting, you can go ahead and measure out your coconut oil and have it ready. You can also set up your containers to be filled as well. That way once the recipe is ready, you can pour quickly. You will need to probably stir the beeswax a couple of times to help break down the chunks. Once it’s melted, go ahead and add in your coconut oil and candelilla wax (if using candelilla wax) and stir well until both are mixed in and the mixture is clear. 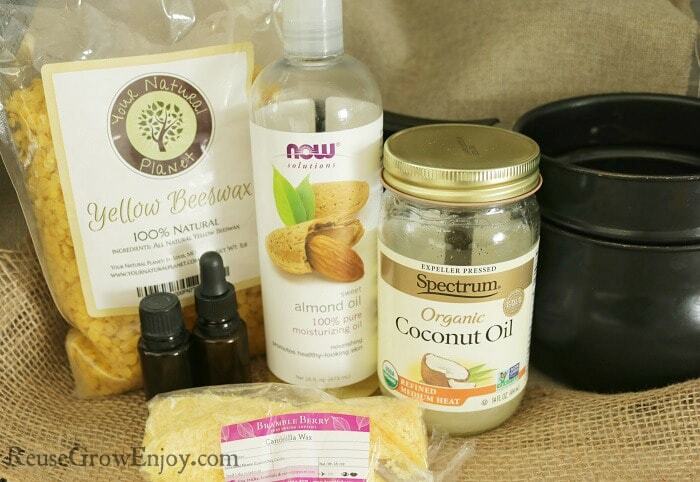 Now, add in your sweet almond or jojoba oil and mix well. Next, add in the essential oils and mix. Overall, your mixture should be fairly thin in consistency and clear in color. You can smell it before you pour, in case you feel it may need a little more peppermint or lavender. Another way to test it before pouring is to just take a little on a toothpick and let it cool for a minute, then try it out on your lips and see how you like it. Once you have it the way you like, you can go ahead and pour into the containers. Take it slow as you pour, it’s very easy to have it run over if you aren’t careful. 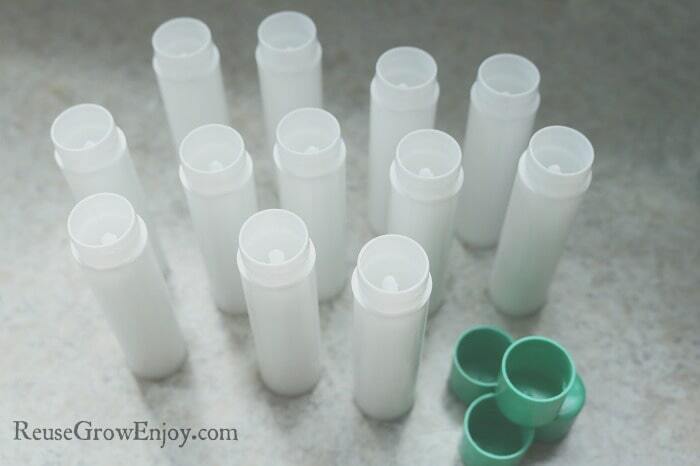 Just leave a small space at the top, and do not put the lids on until the balms are fully cooled. If the balm starts to thicken up, making it hard to pour, just put it back over the heat in the boiler and let it melt again and then continue pouring. Now, let the balms sit out at room temperature for an hour or so. Once the centers of them feel cooled off, they are probably good to go. You can put on the lids and make some cute labels for them. One little tip if you are making your own labels that aren’t already waterproof: Use shipping or some nice, clear tape over the label to keep it nice. That will keep it from getting ruined with time from handling. You can also use the same base ingredients for any lip balm and just change up the flavor by changing the essential oils. If you liked this post, here are a few others to check out.